Image caption John McCain described the legislation as "far from perfect"
A key Republican senator says he will vote for his party's controversial tax plan. 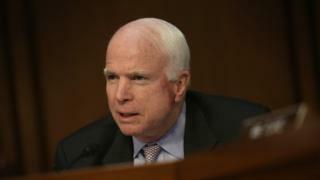 Arizona's John McCain revealed he would back the legislation, although he described it as "far from perfect". The proposal would slash corporate tax rates, a much-disputed move that President Donald Trump argues will boost economic growth. But critics are concerned about the $1.5tn cost and the effect on working families. Mr McCain's support adds momentum to the passage of the biggest revamp to America's tax code since the Reagan era. Congressional Republicans aim to deliver a bill to the president's desk before the end of the year. Republicans in the Senate can afford to lose just two members of their party, and are scrambling to secure support for a final vote on the plan by the end of the week. Mr McCain had appeared to be on the fence about the proposal, saying he worried about its effect on the deficit. But in a statement on Thursday he said: "This is not a perfect bill, but it is one that would deliver much-needed reform to our tax code, grow the economy and help Americans keep more of their hard-earned money." If the bill passes the Senate, lawmakers will have to craft a compromise bill with the House in a process known as going to "conference committee". This is a normal process that occurs when the House and Senate approve similar but slightly different bills. How do House and Senate bills compare? Under the Senate bill, the corporate tax cut would not go into effect until 2019, instead of going into effect immediately. The Senate bill would repeal the requirement that individuals have health insurance or face a fine. That is not included in the House plan. The Senate bill does not allow households to deduct anything for state and local property taxes, a sticking point for lawmakers in high-cost states. The House plan allows families to deduct up to $10,000 in property taxes. The Senate bill doubles the amount of money exempt from inheritance tax. The House plan would also eventually eliminate the inheritance tax entirely. The Senate bill maintains seven tax brackets, but cuts the top rate to 38.5%, while the House would slim the number of brackets to four, preserving a top rate of 39.5%. The Senate preserves some popular benefits for people with medical expenses and student loans, which the House would eliminate. The details of the Senate bill remain in flux. The heart of the proposal is a move to slash the corporate rate from 35% to 20%, a move that supporters say will make the US more competitive. But as a vote nears, some senators have raised the possibility of lowering the rate to 22%, in an effort to reduce the cost of the proposal. The plan would also boost the amount individuals and families can deduct from their tax bill, while eliminating other targeted benefits. That change is meant to simplify tax filing for the average household. But the bill's effects would be much broader. For example, the Senate has proposed eliminating a requirement that people have health insurance - a change that would rock US insurance markets. The US stock market soared on Thursday amid signs the bill will move forward. Investors expect to benefit from lower rates, as companies use additional cash to buy back shares or pay out higher dividends. But the effects of the changes are mixed for households. Wealthy families would benefit from proposals such as one that would increase the amount exempt from inheritance tax. Analyses suggest some lower- and middle-class families would eventually see higher bills as other benefits expire. One of the most controversial parts of the bill is a measure that would stop allowing families to deduct their state and local taxes from their federal bills. The issue is especially important in high-tax states, many of which are Democratic.